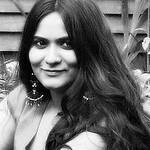 But the biggest challenge of all is getting back to the rhythm of cooking after being spoiled by the amazing food we have been fed, err overfed, by our loved ones back in India. From my amma’s amazing pile of soLe rotti to MIL’s mouth-watering patrode, from our family cook’s delicious raw jackfruit pakoda to the sinful street foods, we have stuffed ourselves to the hilt and it will take months of hard work outs to shed all the extra pounds we have gained. The wise and practical people would go for something healthy after waking from food coma, but I decided to cook carb loaded spuds to serve with a piping hot bowl of rice and dal! Why? Because there is nothing more comforting than a spicy bowl of spuds stir fried with couple of aromatic spices that wraps you in its warmth when you are homesick! 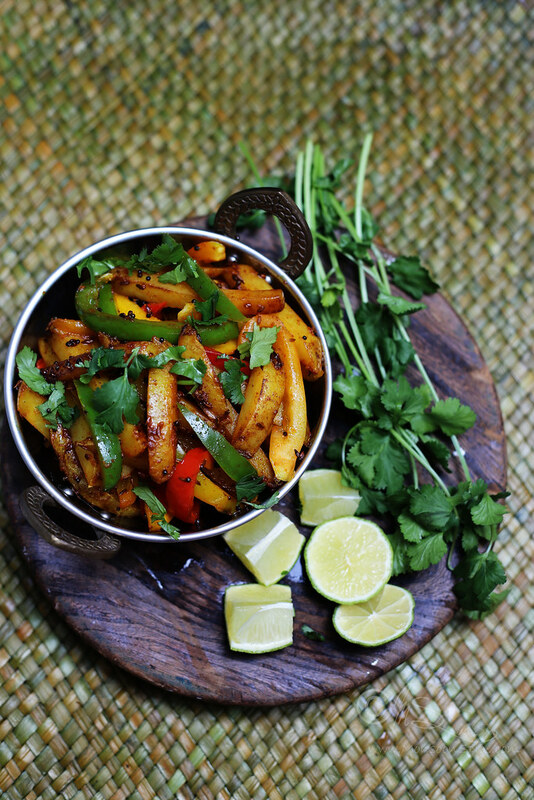 This Vegan Aloo Pepper Fry recipe is as simple as it gets. 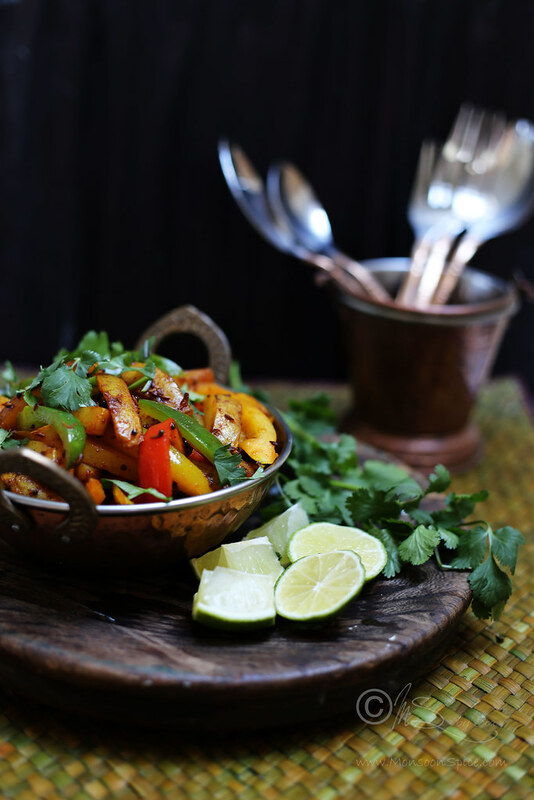 Potato and coloured bell peppers stir fried with minimal spices until they brown and turn lightly crisp. 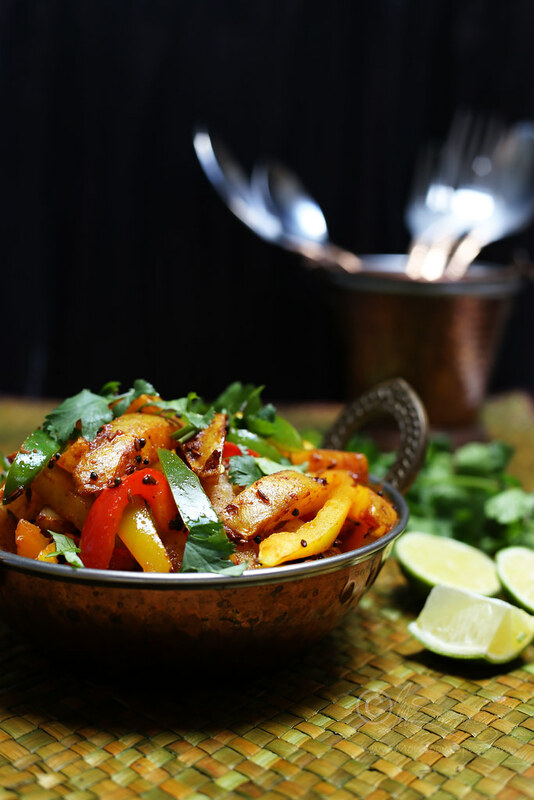 The earthy sweetness of spuds and the crunch from bell pepper are enhanced by the little sprinkling of spices. 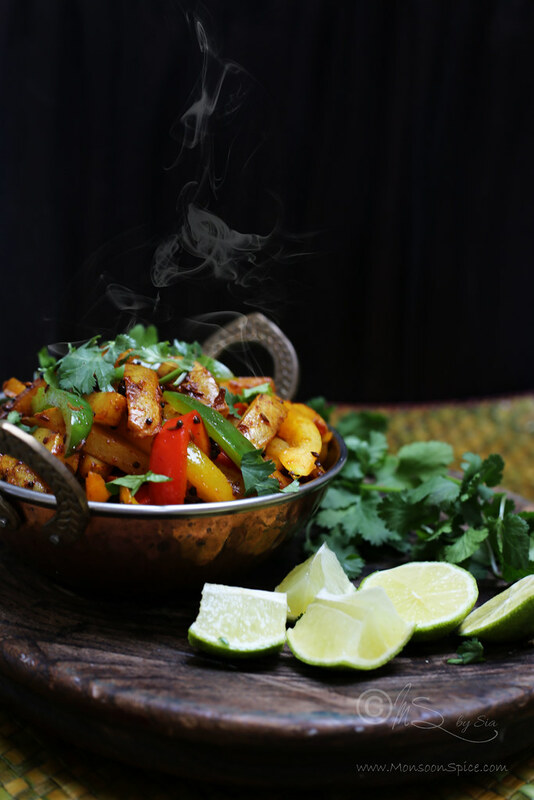 This Aloo Pepper Fry is my go to recipe when I am least inspired to cook and it has never let me down with its amazing flavour and simplicity. It is quick, simple and deliciously morish. Serve it as a side with rice and dal or with roti or use it as a filling for wraps or pitta bread with few salad leaves and a dip of your choice, it will not disappoint you when it comes to taste. Heat oil in a pan or wok on medium flame and add mustard seeds, cumin seeds, dried red chillies and hing. Fry them until mustard seeds start to pop and splutter. Once the mustard seeds pop, add the potato fingers. Increase the heat to high and stir fry the potato fingers continuously for 3-4 mins. Mix in turmeric powder, red chilli powder and coriander powder and mix them well. Lower the heat to medium and stir fry for another 2-3 mins. Mix in bell peppers and salt to taste. Cover and cook for 3-4 mins, stirring in between. 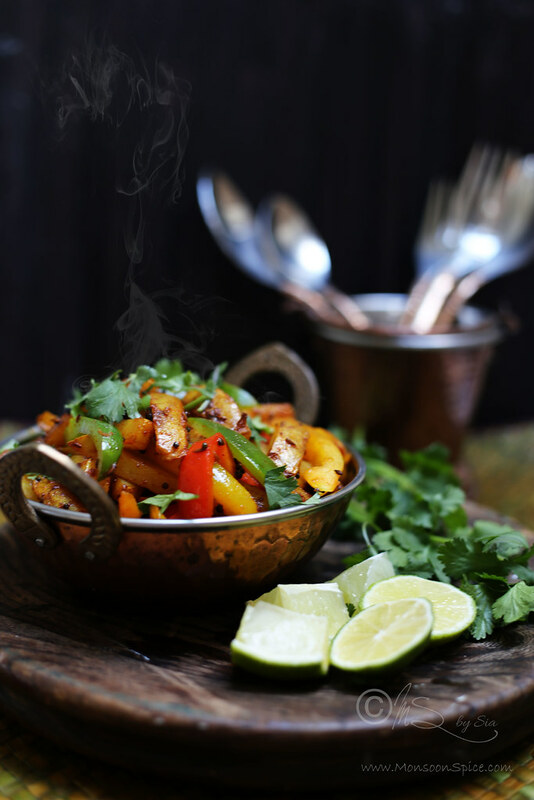 Once the potatoes are cooked through, turn off the flame and mix in freshly squeezed lime juice. Cover and let it rest for 5-10 minutes for the flavours to blend well. 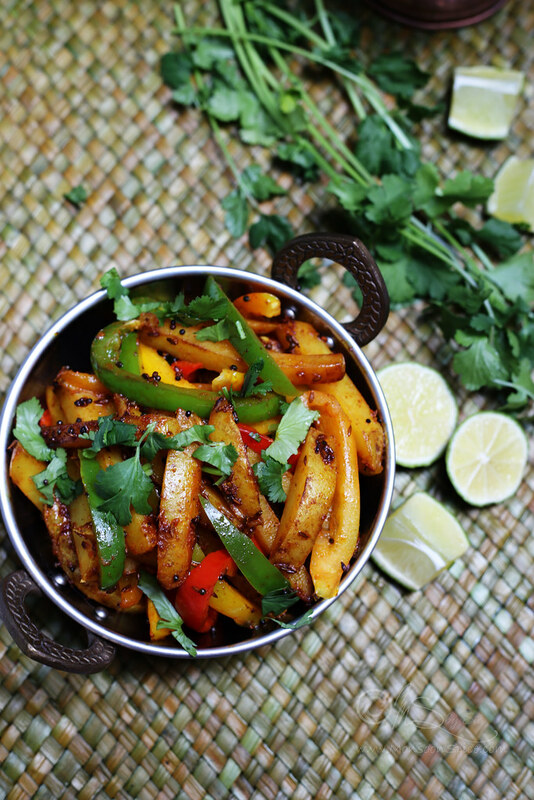 Serve this simple yet delicious Aloo Pepper Fry with rice and dal or with roti and enjoy! I keep the potato skin on as I find their earthy taste quite flavourful. You can peel the skins if you are not too fond of them. Apart from serving this Aloo Pepper Fry with plain rice and dal, you can also use this as a filling for wraps for on the go meal. It was yummy Sia, thanks for sharing this recipe!! Lovely Sia! Looks soo tempting! 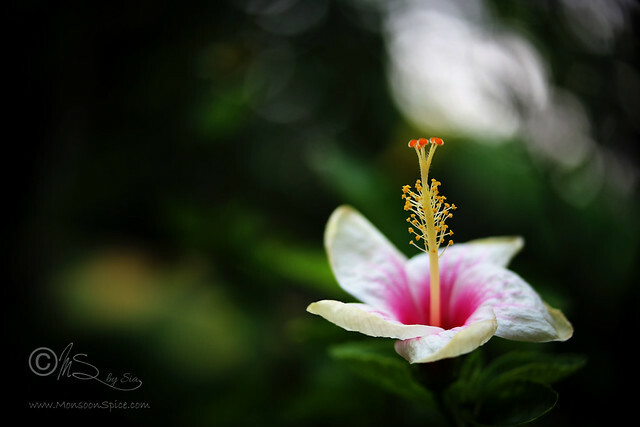 Awesome clicks as always! Simple aloo fry with a bowl of rice and dal is something I can never get tired of eating :) Glad you like it. Do let me know if you try it, Rafeeda. A wonderful combination. This dish looks so mouthwatering. 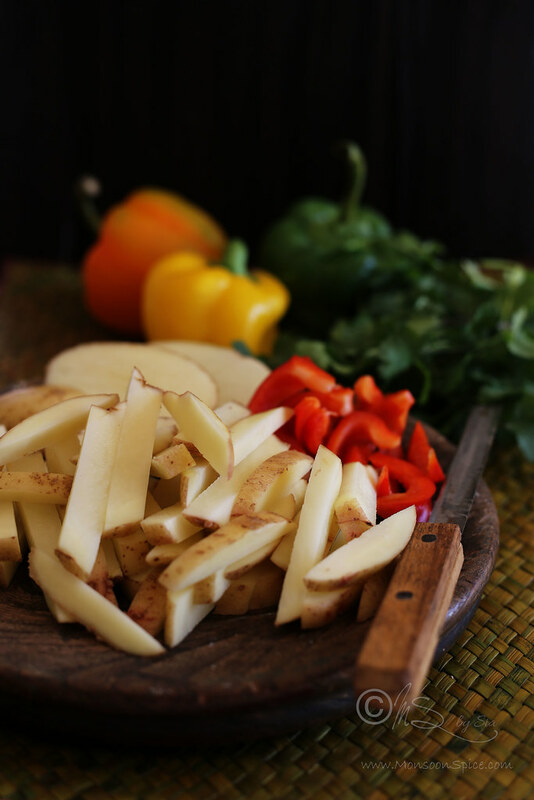 Potatoes and bell peppers are two of my favorite ingredients. Thank you, Rosa. IMHO, potato and bell peppers are made for each other. :)I can never get tire of cooking and eating them.